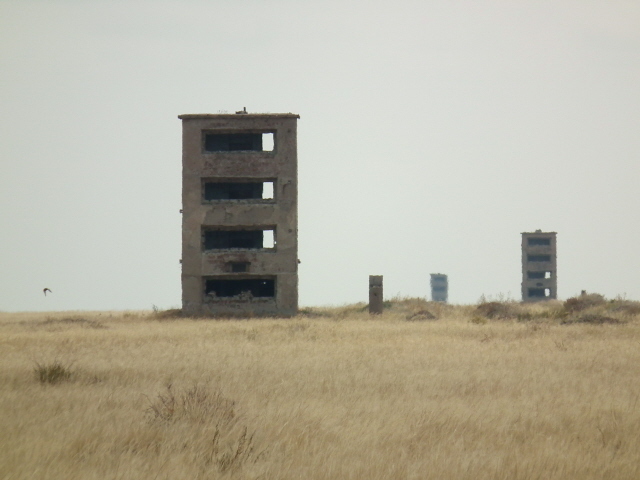 Also known as the Semipalatinsk Test Site (STS), this ia a desolate area in the steppe of eastern Kazakhstan that formerly was used by the Soviet Union for most of their tests of nuclear weapons during the Cold War years. It was thus the USSR's equivalent to the USA's Nevada Test Site (NTS), but unlike the latter it was shut down for good in 1991. More background info: the Soviet Union's programme to develop nuclear weapons had at first been a slow and somewhat half-hearted undertaking. But after the USA not only successfully tested such a bomb (Trinity) but even used them for real in the destruction of Hiroshima and Nagasaki at the end of WWII, Stalin pushed for the USSR's own nuclear capability to be developed as swiftly as possible as the Cold War was setting in. As if to underscore the urgency, Stalin's former head of national security, the infamous Lavrentiy Beria, was chosen to oversee the project. It was also Beria who in 1947 selected the location for testing, a vast 18,000 square kilometres' (7000 square miles') area of steppe in eastern Kazakhstan – which Beria declared uninhabited, even though this was not in fact completely true. Whether it was a genuine oversight or whether he deliberately made civilians part of the big experiment is not entirely clear. The latter is usually assumed by default. It is assumed that the push for nuclear weapons would have brushed aside any health concerns in any case. And apart from the few thousand peasants, nomads, shepherds and cattle herders within the actual wider area of the test site and its immediate environs, the city of Semipalatinsk (now Semey) with its 150,000 inhabitants was close enough to be at direct risk from radioactive fallout. The scientific head of the programme was the physicist Igor Kurchatov – and the headquarters of the test programme was set up in a "secret/closed town" that has henceforth been named after the man himself: see under Kurchatov town. This is still the only larger settlement in the vicinity of the testing area. The name for this area, other than simply "Semipalatinsk Test Site" (STS), is usually "the Polygon" (after the geometrical figure it forms on the map). Within this area, the first and thus historically most significant part was called Opytnoe Pole, which translates as "Experimental Field". Over 450 nuclear test explosions (most sources give the total figure as 456) were conducted at the STS. Of these, well over a hundred (115 or 116) were atmospheric, i.e. set off either in-air (dropped from planes), from towers or directly on the ground, between 1949 and 1963, at various sub-sites of the Opytnoe Pole. This included the first ever Soviet nuclear device, RDS-1, also pompously code-named "First Lightning" ('Pervaya molniya' in Russian), which was successfully set off on 29 August 1949. The USA later nicknamed the device/test "Joe One" – in overt allusion to Josef Stalin (who is himself often referred to as "Uncle Joe"). It was more or less a copy of the American plutonium implosion bomb of the Trinity and Fat Man (Nagasaki bomb) design. And it is usually assumed that espionage was behind the similarity of the designs … It had a similar yield too: ca. 22 kilotons. Sites at Opytnoe Pole were also used for other firsts, including, in particular, the Soviet Union's first proper hydrogen bomb, RDS-37, which was successfully tested in November 1955 (following the precursor thermonuclear device RDS-6s in 1952, which is, however, not usually regarded as a genuine hydrogen bomb). RDS-37 was also the world's first air-dropped hydrogen bomb. From 1961 initially, and from 1963 exclusively, tests were moved underground (in accordance with the Partial Test Ban Treaty). For those underground tests, both horizontal tunnels and vertical boreholes were used, in particular at two sites in the south and east of the Polygon, namely at an area called Balapan and in the Degelen mountains. The infamous Chagan Test conducted in January 1965 falls between the categories of underground and atmospheric test, as it were, in that it was set off shallowly underground but burst through the surface, thus releasing radioactive fallout into the atmosphere (which subsequently was measured as far away as Japan). Hence, the USA protested against this test as a violation of the Partial Test Ban Treaty, which was signed by the USSR in 1963. The Chagan test was the largest of the so-called "civilian" nuclear tests. It's aim was to explore the possibilities of utilizing the power of a nuclear blast for civil engineering purposes. It certainly proved its power, ripping up a crater over 400 metres (1300 feet) in diameter and 100 metres (328 feet) deep, shifting millions of tons of soil and partly damming the nearby river (as intended). The crater is filled with water and this body of water has thus also been dubbed the Atomic Lake. Because explosions of this kind create significant amounts of radioactive contamination both on the ground and partly in the atmosphere, subsequent tests were significantly scaled down – and eventually dropped altogether. From today's perspective it seems incredibly naïve and reckless to think nuclear power could be used in such "civilian" ways. But that naivety was by no means limited to the Soviet Union. In fact, the Chagan test more or less copied an earlier test conducted by the USA at the NTS in 1962 (code-named Sedan and part of Operation Plowshare). The hazards involved in nuclear testing and its environmental impact also led to the formation of the NGO known as the Nevada Semipalatinsk Movement, which, as the name implies, reached across the Atlantic and teamed up with counterpart protests in the USA especially against the NTS. Within the USSR this was quite a pioneering development, partly made possible by Gorbachev's Perestroika. Pressure from this NGO is generally seen as one of the reasons why nuclear testing was suspended at the STS in 1989. Then, with the collapse of the Soviet Union and Kazakhstan becoming an independent state, it was quickly decided in 1991 by President Nazarbayev that all nuclear testing at the Polygon should cease for good, i.e. that the test site as such was to be "closed" altogether. 15 years later, in 2006, Kazakhstan and its Central Asian neighbouring countries (i.e. all the five "-stans", including Uzbekistan and Turkmenistan) signed a treaty for the whole region to be "nuclear-free". However, some nuclear activity is still going on at the STS – albeit no longer involving military nuclear weapons testing. But the National Nuclear Centre (NNC) of Kazakhstan at Kurchatov, which is responsible for the Polygon, still maintains two scientific reactors and other nuclear research facilities. One also has to remember that Kazakhstan has ambitions to develop nuclear power generation on a larger scale to meet its energy demands! Furthermore, the NNC is conducting surveys of radiation distribution within the Polygon. Today, the Polygon is still in a state of transition, as it were. Officially, it is forbidden to conduct any kind of business within its perimeter without a special license. But that does not deter farmers from grazing their cattle here – unauthorized. It is totally illegal to remove anything from the area, in particular metal objects. But exactly that has been happening for years and years and is still going on – despite the risks posed by these radioactively contaminated materials (see below). Authorized activities within the Polygon include, in particular, mining operations in the area north of the Balapan site. Apparently the economic temptations of mineral extraction outweigh the concerns over radiation. On the other hand, the overall contamination of the area at large is not actually as serious as one might expect from a history of 40 years of nuclear testing. When I was at the Opytnoe Pole site, the highest radiation we measured (near "ground zero") was 70 times above normal background levels – far from the alleged 400 times elevated radiation levels that some sources claim as the general norm of contamination within the STS. It's certainly not as dramatic as that. One of the probably most reliable sources, the IAEA, has also concluded that over most of the area of the Polygon, radiation levels are low enough so as to pose no significant health hazard. It also confirmed, however, that there are indeed pockets of elevated residual radiation, including a few that are considered dangerous, e.g. at underground boreholes that vented into the surface, and especially at sites where direct on-surface bombs were detonated, resulting in the melting of rock and direct depositing of fission material in the ground. The status of the Atomic Lake and some other similar sites is also questionable. But the majority of the land is more or less fine to walk on these days. Still, the experiments at the Polygon, in particular all those atmospheric tests of the late 1950s and early 1960s, left a legacy of medical damage that is still very much in evidence and will probably be with the people of the surrounding territories for some time to come. This mostly takes the form of cancers and, especially visibly, frequently occurring birth defects, including serious, even terminal, deformities. The Anatomical Museum of the Medical University of Semey is the place to witness the most drastic evidence of this sort. What there is to see: not actually that much to look at. Apart from the dents and holes in the ground made by the above-ground explosions (including a couple of lakes), it's mainly just a few remains of surrounding infrastructure that still stand as silent traces of the area's grim past. The rest of the Polygon is just empty steppe and a few low and bare mountains. Yet it's the knowledge about the place that still makes this a thrilling place to visit for the dark tourist, in particular, of course, those with a taste for Cold War history and nuclear tourism in general. The historically most significant individual site within the Polygon, and the one that most visitors are primarily steered towards, is the one called Opytnoe Pole. It was here that the very first Soviet atomic bomb was set off in 1949 – i.e. it's the East's equivalent of the Trinity site in the USA. Unlike at Trinity, there's no marker or indeed any other form of commodification at Opytnoe Pole. However, there are quite a few striking concrete remains of the test site infrastructure. The most visible ones are rows of concrete towers, which at the time of testing housed various measuring equipment. These are aligned almost on straight lines at different distances from "ground zero". Some closer to that spot show clear signs of charring. 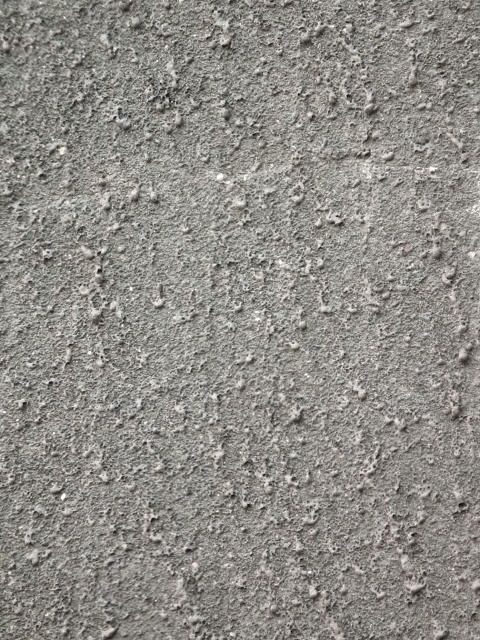 On closer inspection you can even see that the outer surface of the concrete shows bubbles – where evidently the heat of the blast made the concrete melt! Some towers are also cracked. The larger towers further away have several levels for the instalment of equipment. But of course all such equipment is long gone. (But quite a few such items are on display in Kurchatov's Museum of the Test Site.) In addition to the multi-level towers there are also countless little bunker-like blocks with holes in them, which presumably also once contained some sort of equipment. 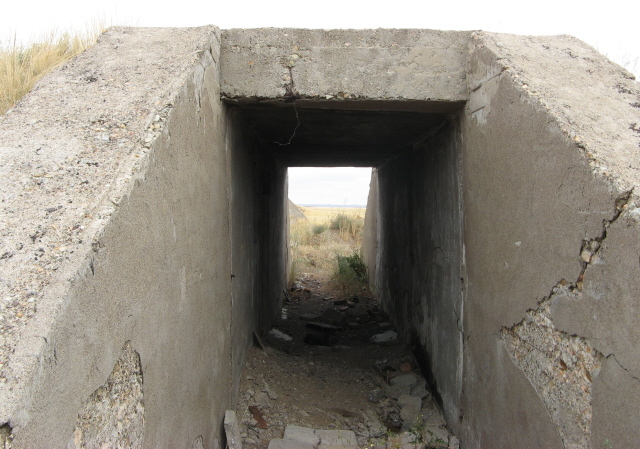 Together these concrete structures are the most iconic – and most photographed – of the Semipalatinsk test site. Apart from the measuring towers and bunkers, there were also structures such as houses, bridges, etc. specifically built in order to determine the effect a nuclear explosion would have on them. Of these the remains of a road bridge are the most obvious example still discernible. You can clearly make out the two approach ramps, while the actual bridge part between them has collapsed. Of the houses, only rubble remains. I haven't seen it myself, but my guide also reported of an underground mock-up metro station, which was also constructed for test purposes, and which can still be explored. Unfortunately, there was not sufficient time to do so during my short visit in August 2011. What we did do, however, was enter one of the bunkers adjacent to one of the measuring towers. This led to an underground cavern of unknown purposes. But the lower level was flooded and thus not safely accessible. There were also various mysterious tunnel access manholes leading down into dark depths, but again, these sensibly remained out of bounds. What was scarily in evidence everywhere was signs of looting: trenches from where scrap metal scavengers had dug up the soil to take out cables, pipes and so on. This is obviously illegal – but as it is not properly policed, such looting has been a reality for many years. Just to think how much radioactively contaminated metal from the Polygon must have been sold off as scrap, typically ending up in China. It beggars belief that anyone would do that. But it's indeed the case – probably desperate measures driven by poverty. And it's still going on: I saw at least two convoys of scrap metal hunters actively at work in the distance. I don't even want to think about what all that metal may have been used for and where it may have ended up (maybe parts of it are in our mostly Chinese-made microwaves, fridges, or even our cutlery?). Surprisingly, then, not all the metal has been taken. There are rusty bits and pieces still strewn about. One wonders why these were not picked up when others were even laboriously dug up from underground. Likewise, we found a long stretch of bundled up barbed wire – possibly remains of the outer fencing that encircled the Opytnoe Pole site. Why that's been left there is a mystery too. Mainly for reasons of limited time I was unfortunately unable to see what is possibly the second most interesting site within the Polygon, namely the so-called Atomic Lake on the south-eastern edge of the area. This is a water-filled virtually circular crater some 400 metres in diameter and 100 metres deep that was the result of the Chagan Test in 1965. This was the largest of a series of "peaceful" tests in which civilian uses of the power of nuclear devices were explored. The resultant artificial lake is still there – and it has been visited by curious enough travellers. My guide said that he had indeed taken tourists there himself. On the other hand, the information available from the operator Ecosystem (see below under access) suggests that it may not be safe to go directly onto the shores of the lake. Whether or not that is the case I cannot judge. The tunnels and boreholes of the underground tests at Balapan and Degelen have all been sealed – and they would as such not have been much to look at in any case. But some remains of the infrastructure are allegedly still in evidence. But, again, I cannot comment on this first-hand either as I didn't venture so far south on my short 2011 visit to the Polygon. The same holds for a ghost town that I have seen intriguing images of, and which is located north of Balapan, near Ak-Bota. But I know nothing about either the history of that place nor whether it can safely be visited. The pictures looked quite similar to those of the ghost town of Chagan, though. And that place can be visited fairly easily en route from Semey to Kurchatov. Location: in the east of Kazakhstan, immediately to the west of the town of Kurchatov, and ca. 65 miles (150 km) from the city of Semey. The historic Opytnoe Pole site is in the northern half of the Polygon, closest to Kurchatov, ca. 20 miles (30 to 40 km) to the west of it, while the Atomic Lake is in the south-east on the edge of the Polygon. The Degelen mountains are in the centre of the southern half of the Polygon. Access and costs: very remote and restricted. Details: since the test site was closed and the Soviet scientists and military left, the site lay simply abandoned, and local shepherds and cattle herders as well as intrepid travellers could simply wander in. Obviously, that's been a cause for concern, as parts of the area are still dangerously contaminated. UPDATE: security has been tightened up in more recent years, and you can no longer just drive in. Permits are now officially required! To go in safely you have to have guides who know what they're doing in any case. Apparently, the National Nuclear Centre can provide such guides, but it may be quite a hassle getting this organized – see the account of such a visit by journalists in A Nuclear Family Vacation. However, there are also at least three tour operators that offer visits to the Polygon as part of their portfolio of specialist tourist itineraries. One called Ecosystem, based in the East Kazakhstan city of Ust-Kamenogorsk (Oskemen), even offers a tour that takes on elements of a scientific expedition, including camping in tents within the Polygon itself – you are advised to bring your own Geiger counter/dosimeter! These "scientific" tours are advertised as running between May and September. 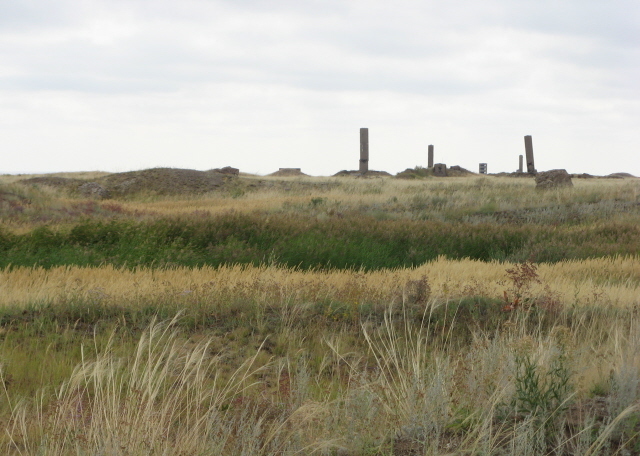 If the length and nature of such a tour seems too extreme, you can just visit the historic Opytnoe Pole site as part of a longer itinerary (entitled "Back in the USSR") offered by the Karaganda-based operator Nomadic Travel. This is how I travelled there. Their tour can also, and with much greater ease than dealing directly with Nomadic, be organized through a few other agencies, in particular the Dutch company Kazachstan Reizen/Kazakhstan Tours – see the sponsored page for this company here. From 2018, another enticing tour package on offer is by Koryo Tours (normally specialists in North Korea). Part of their 10-day itinerary are two forays into the Polygon (including the Atomic Lake! ), as well as time in Kurchatov, Chagan, Karaganda/KarLag and the two main cities. See the sponsored page for Koryo Tours (links to their Kazakhstan tour provided there). Nor did we encounter any actual hassle on the way in, no checkpoints, no dealing with police or military, no nothing. We simply took a road west from the train station in Kurchatov and kept heading straight on, driving along rough tracks until the old measuring towers of the Opytnoe Pole site became visible on the horizon. 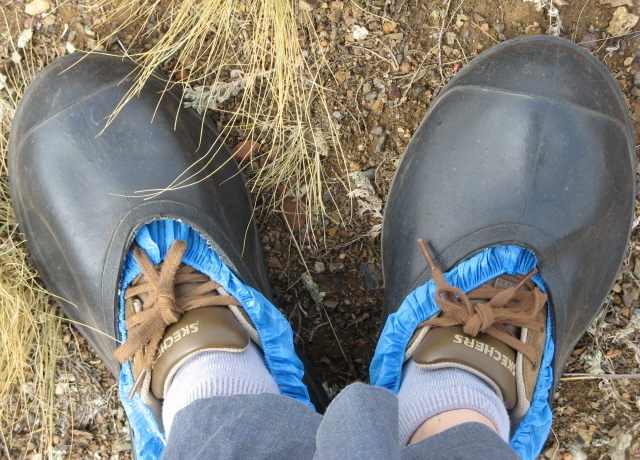 A bit after that we put on protective shoe covers (double covers, in fact, including "overshoes" that were cut-down wellington boots), as well as face masks, which we kept on until we had driven a safe distance away from the site again. Our guide had a Geiger counter on him the entire time. Only as we drove past the "ground zero" spot (where we did not get out of the car!) 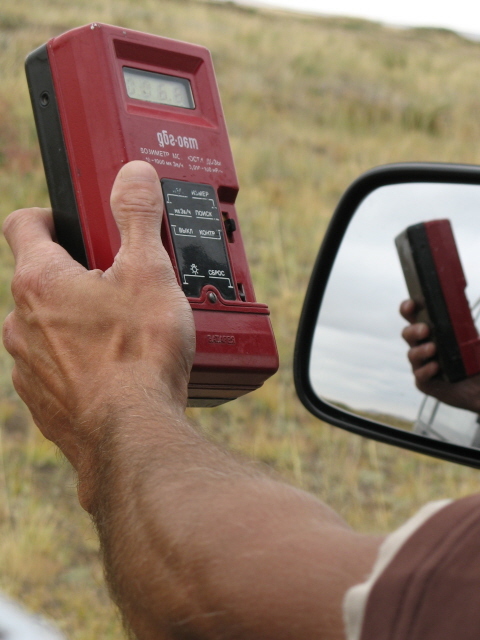 did that dosimeter show readings that were significantly above the regular level – about 70 times higher. For just a few moments even that is not much reason to be worried. Where we walked around, the radiation was never at a seriously dangerous level. Still, you have to be careful and follow all instructions. In particular you should avoid touching anything, let alone picking anything up to take as a souvenir. It's bad enough that scrap metal hunters dig up stuff and take it out. But it's certainly not an example to be followed! UPDATE: apparently you can no longer just drive in like we did in 2011. Security has been tightened up and permits are now required! As for health and safety: while a short visit to Opytnoe Pole shouldn't pose any real risks, other spots within the Polygon may be more problematic. For instance, it isn't entirely clear whether or not it's safe to visit the so-called Atomic Lake in the south-eastern part of the Polygon. According to Ecosystem, the actual shores of the lake are unsafe, but people have certainly gone there (as evidenced by several photos travellers have put online). It is also included in Koryo Tours' itinerary (see sponsorded page), so it is probably alright for a short glimpse. Other spots may still be too unsafe to visit. A map produced by the Ecomuseum in Karaganda (with financial support from the OSCE) gives a rough indication of how contaminated various parts of the Polygon are. But it's hardly detailed enough to serve as means for navigating independently. Ultimately you will in any case have to rely on guides in the field. As for costs, it is difficult to estimate how much just the Polygon component of those tours that incorporate this would be. But it's certainly in the region of a few hundred EUR for the hire of a vehicle, driver and guide alone. Plus accommodation and fees. You will have to make enquiries and compare actual prices for yourself. Time required: depends. A quick visit to the Opytnoe Pole site, with about an hour or so of poking around the remains in the vicinity of the historic "ground zero", will take about half a day including all the driving, most likely from Kurchatov – or as much as a whole day if you come from further afield and/or travel on to somewhere else afterwards. This was the case on the tour I did. To see more of the area you'd necessarily have to allocate more time – one tour I found advertised (by Ecosystem – see above) has two full days in the Polygon alone, as part of a six-day itinerary that also takes in both Semey and Kurchatov. Combinations with other dark destinations: the most obvious choice is Kurchatov – the town that used to be the HQ for the Soviet atomic weapons testing programme. It can now be visited, albeit only with a special permit, and serves as the natural base for excursions into the Polygon. The Museum of the Semipalatinsk Test Site in Kurchatov is a must for anyone interested in the topic. Similarly, the city that gave the test site its internationally better known name, Semipalatinsk, today officially called Semey, has a number of sites related to the legacy of nuclear testing, not least the grim anatomical museum of the city's Medical University which contains stark evidence of the gruesome consequences of radiation on humans. 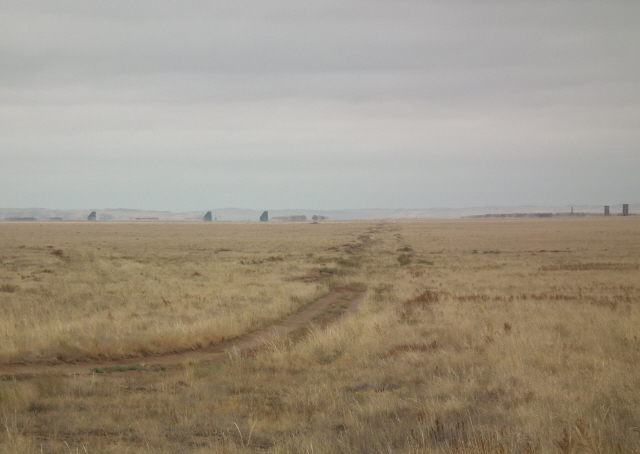 Combinations with non-dark destinations: not much – this desolate area in Kazakhstan was chosen precisely because it is so empty and featureless. However, just a 100 miles (160 km) or so to the south-west lies a nature reserve that may appeal to a more mainstream outdoorsy kind of taste: Karkaraly, near the town of the same name (which is also still widely known under its former Russian name Karkaralinsk). And to the east, the city of Semey, formerly Semipalatinsk, i.e. the name under which the test site is/was most widely known as well, does have a few merits of a non-dark nature too.